Lewis Jordan was at the end of a 49-year career in the airline industry and had served as President and Chief Operating Officer for both Flying Tigers, the world’s largest international cargo and military transport airline and Continental Airlines. He co-founded ValuJet Airlines and served as its President and later its successor, AirTran Airways where he also served as Chairman until his retirement from active management in 1997. He remained an active member of the AirTran Board until the acquisition of AirTran by Southwest Airlines in May of 2011. When the company was sold to Southwest airlines in May 2011, Lewis and his wife, Joni decided it was time to give back. The couple considered several causes they might support, including the fight against cancer. 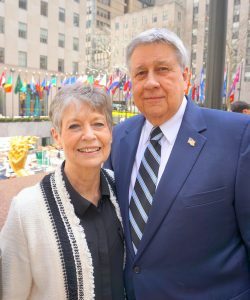 Joni Jordan is both a breast cancer and pancreatic cancer survivor, and although the couple gives regularly to cancer relief efforts, the couple decided their support would be to a different kind of nonprofit organization. “Our hearts have gone out to the news reports that we get every day of people who have been killed or wounded in Afghanistan or Iraq and the alarming suicide rate among returning veterans,” Jordan said. “It seemed in my mind that veterans needed some additional attention. He and Joni knew they wanted to spend their retirement giving back to the country that had given them so many opportunities for success. Toward that goal, they founded Gratitude America to help veterans suffering with the PTSD and the invisible wounds of war. We owe our military, our veterans, their families and families of the fallen a debt we can never fully repay. The American people want to help, but in some cases just don’t know how. Many of these heroes face physical and emotional wounds, unemployment, families that are not always intact and other hardships.